High ticket ecommerce — or businesses that sell valuable items such as electronics, jewelry, luxury goods or services, or collectibles (to name a few) — look great on paper. The profit margins can be stunning compared to low ticket items, even if you make many conversions. That’s because the acquisition of leads often costs nearly the same. Let’s say a lead for both a high ticket and low ticket item is $100 — wouldn’t it be fantastic to make a conversion worth $1,000 than $150? For the same amount of sunk cost, you’d be making $900 in profit, versus $50. In other words, you’d have to sell 18 of the lower ticket items to make the same as just one high ticket item. This profit margin means that scalability is more within grasp for higher ticket items, an enticing prospect for any ecommerce startup. However, high ticket ecommerce merchants face some unique hurdles that might make it harder to lift a new business off the ground, not to mention scaling it successfully. First, these businesses are generally ecommerce startups — a mark against them when it comes to finding a merchant account. Why Are High Ticket Ecommerce Startup Merchants High Risk? This might seem unfair on its face, but it’s important to understand where merchant accounts are coming from when they think of ecommerce merchant startups as high risk. First, startups can be unpredictable: there’s no surefire way to know if a business will succeed or fail, and merchant accounts want to protect themselves and their banks. Up to 75 percent of startup ups don’t make it, so it’s understandable that these providers want to exercise caution. Next, startups lack one of the most important things that merchant account providers use to evaluate a business’s potential: a payment processing history. A rock solid credit card history can go a long way towards establishing credentials with a payment provider, but ecommerce startups, like high ticket ecommerce merchants, have to make do with personal banking statements, credit scores, or a business plan. Finally, a startup might not (yet) have a lot of capital behind them. Though this isn’t necessarily a dealbreaker, it’s understandable that some merchant account providers will feel that they’re taking a risk with business that doesn’t have a lot of backing. 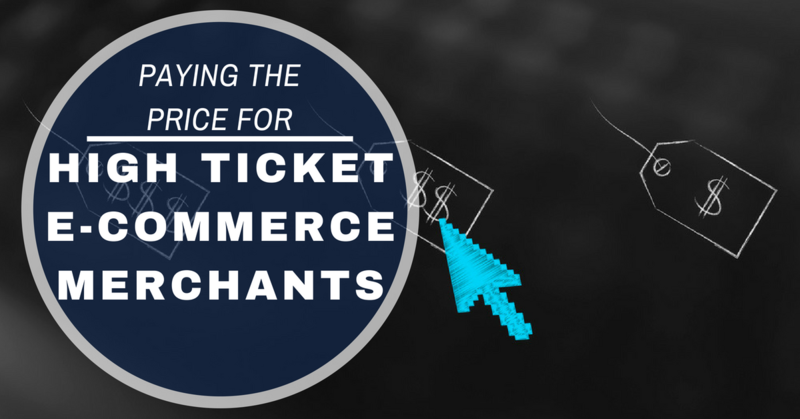 Unfortunately, being an ecommerce startup is not the only reason that high ticket ecommerce merchants might have some troubles acquiring a merchant account. Selling high value items also has some inherent risk, as far as merchant account providers are concerned. One of the reasons for this is the increased risk of chargebacks. High ticket merchants generally see more excessive chargebacks than typical ecommerce merchants. Consumers are more likely to either change their minds or dispute a transaction when the risk of loss is $2,000 versus $20 — and that means the risk of loss due to chargebacks or friendly fraud for these high ticket ecommerce merchants is higher. Getting hit with too many chargebacks in any industry is tough, but for a high ticket ecommerce merchant it could be lethal for the business. Not to mention, businesses that sell high ticket items are more common targets of fraud. All of these risks add up to make high ticket ecommerce merchants a high risk. Even if these ecommerce merchants are able to find a merchant account that will take them, they will likely still have to pay fees that are through the roof. And because of the financial risk that’s inherent in high ticket businesses, many will end up with monthly credit card processing caps. Once the merchant reaches that cap, they can no long take sales until the next month and the cycle restarts. Even though the cap will mostly likely be lifted eventually, this can really hobble ecommerce startups that are trying to scale. Thankfully, high ticket ecommerce startups aren’t out of luck. Working with a specialized payment processor is a great alternative option for these merchants. These payment processors understand the life of a high risk business owner, and are prepared to offer assistance tailored to businesses that face these unique struggles. Because these specialized processors are used to working with high risk merchants, they’ll be able to help a merchant account that won’t get terminated suddenly (a real possibility for businesses that face high chargebacks). Thanks to their experience and relationships with banking partners, they can also help merchants save money on processing fees. Finally, these payment processors have tools in place to help with common problems high risk merchants face (for example, top of the line fraud and chargeback prevention). Opening a high ticket ecommerce business offers a lot of exciting opportunities. However, there are some drawbacks to operating a high risk ecommerce startup. Merchants who want to mitigate these risks while enjoying specialized service and lower fees should consider if a high risk merchant account provider is right for their business.